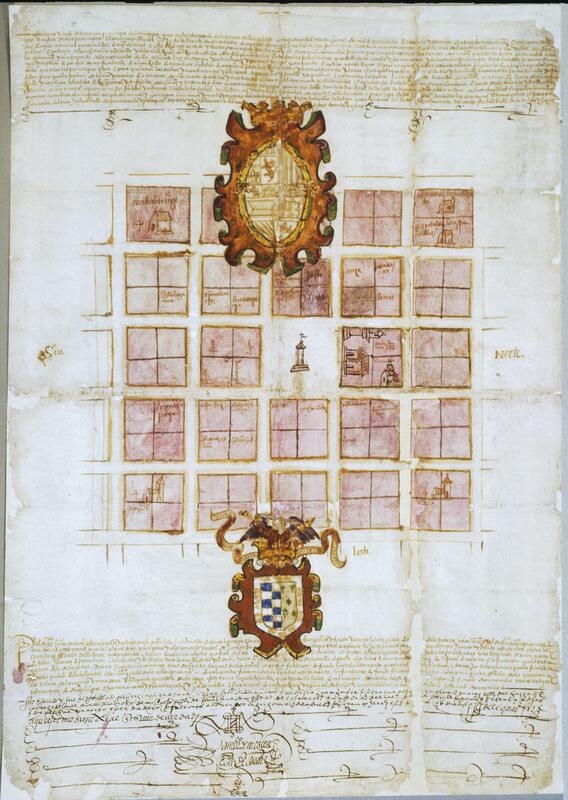 This is a plan drawn up for the founding of the city of Mendoza, Argentina. It follows a standard grid plan, one mandated by the Spanish royal government for new towns founded in the colonies. City plans—at least those crafted by Spanish hands—exhibit a consistent set of features: a grid-layout with church and main administrative buildings nearby. Sites in the new city were parceled out among the original Spanish settlers who are named on this plan. Today, the city of Mendoza, Argentina is likewise dominated by a grid plan like the one laid out in the 16th century. Plans such as this one, with its grid and official seals hovering against blank paper, imply that the cities of Spanish America were to be laid out upon a “clean slate,” or uninhabited land. But such a thing rarely existed in the settled and urbanized New World. Sixteenth century maps were rarely made by professional mapmakers. Instead, a professional scribe, probably the same one writing the accompanying document, would be called upon create the map. The map is made on European paper with ink and pigment. It measures 23 x 17 inches (59 x 43 cm). This plan was made for the settlers of Mendoza (now in Argentina) who came out of the battle-hardened town of Santiago (now in Chile). With Amerindian armies resisting Spanish incursions, these settlers pushed east over the Andean cordillera to found Mendoza. 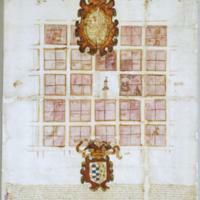 Today, as with many other official documents pertaining to the Spanish conquest of the Indies, the town plan is in the Archivo de Indias in Seville. In the 16th century, the Spanish crown saw cities as the linchpin of colonization. It mandated their founding, prescribing a logical and predictable structure. With the standard plan in hand, Spaniards sought to make their imprint on the vast and often hostile landscape of the New World. Kagan, Richard con Fernando Marías. 1998. Imágenes urbanas del mundo hispánico, 1493-1780. Madrid: Ediciones El Viso. Kagan, Richard with Fernando Marías. 2000. Urban Images of the Hispanic World, 1493-1793. New Haven: Yale University Press. Martínez, Pedro Santos. 1994. Mapas, planos, croquis y dibujos sobre Cuyo durante el período hispánico (1561-1810). Mendoza: Ediciones Culturales de Mendoza, Junta de Estudios Históricos de Mendoza.